Osterville is one of seven villages within the town of Barnstable, Massachusetts, United States. The village of Osterville is located on the south side of Barnstable on Nantucket Sound. 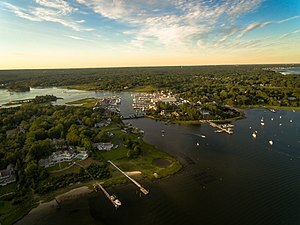 Osterville is a residential community that includes marshes, bays, ponds, a small lake, beaches, and a small business district. Osterville was originally named Cotacheset, based on the Native American name for the area. Over time it became a center for "oystering" (harvesting wild oysters) and was renamed Oysterville. Later a map misspelled the name as Osterville and the village became so. Membership in the Osterville Historical Society is not limited but village-wide and open to all who are making history today, steadily swarming over the pleasant acres that “Paupinanack sold for a copper kettle and some fencing done.” How many years ago? About 1648 The range of “Cotacheset” was along East Bay and the Centerville River, and when a man said he was going down to Kocochoice, he meant where Crosby’s boat shop is now, along West Bay. The part of the David Estate that adjoins Marstons Mills was known as Mystic. The Shawme Indians being neighbors to Roger Goodspeed who was the first to venture into this territory. The Historical Society all began when a small group of three people recalling old tales of older generations. Promptly the group increased and interest as well, in back tracking to the very first, few that planted another firm foothold on Cape Cod sand. The cemetery for the village of Osterville is the Hillside Cemetery on Old Mill Road. The Osterville Historical Museum, established in 1931, preserves the history of Osterville for all of those who love her, past, present, and future. The museum includes the largest collection of wooden boats in Massachusetts and is home to the Crosby Boats. The Crosbys are America's oldest, currently active, wooden boat building family. The Cammett House, the oldest house in Osterville, and the Captain Jonathan Parker House, owned by a 1820s coastal schooner captain, are also located on the museum campus. A series of boat shops includes the 1850 original Herbert F. Crosby boat shop. Every Friday mid-June to mid-September, the museum hosts the Osterville Farmers' Market. Armstrong-Kelley Park, the oldest and largest privately owned park on Cape Cod, is located in Osterville. Crosby Boat Yard is port to the Crosby catboat, and the Wianno senior, the latter a favorite of nearby Hyannisport resident President John F. Kennedy. A steel drawbridge connects the village to Little Island and Grand Island (also known as Oyster Harbors), a gated community featuring many luxury houses and a private country club. The neighborhood of Wianno abuts the East Bay section of Osterville. There are two private country clubs in Osterville: The Wianno Club and the Oyster Harbors Club. Each club has a private 18 hole golf course, private tennis facilities, and a private beach. The Wianno Yacht Club, a private club on West Bay, offers children's sailing lessons. Dowses Beach in Osterville is a town of Barnstable beach, there are toilet facilities with showers and a beach house for changing in privacy. Lifeguards are present during the summer months only. Osterville is home to a private K-12 school, Cape Cod Academy. Jack Birmingham, former NASCAR Winston Cup Series owner from 1999 to 2001. James M. Gavin, World War II general, US ambassador to France. Andy Hallett, actor and singer who appeared on the WB's Angel (TV Series). David Hartman, the first host of ABC's Good Morning America. Gene Rayburn, host of the popular 1970s game show "The Match Game". Richard B. Sellars, Chairman and CEO of Johnson & Johnson. Bob Vila, former host of This Old House. Kurt Vonnegut, 20th century American Writer. ^ "Osterville Historical Museum - Home of the Crosby Boats - Osterville, MA". www.ostervillemuseum.org. Retrieved 2017-05-24. ^ Marquard, Bryan (2016-07-27). "Charles Bilezikian, 79; created the Christmas Tree Shops empire". Boston Globe. Retrieved 2016-08-24. ^ Shields, Charles (2011). And So it Goes: Kurt Vonnegut, A Life. New York: Henry Holt and Company. p. 119. ISBN 9780805086935. This page was last edited on 16 April 2019, at 05:12 (UTC).